Lanka Indian Oil Company (LIOC), a subsidiary of Indian Oil Corporation will intensify their bunkering operations in Sri Lanka focusing on the Trincomalee Port. 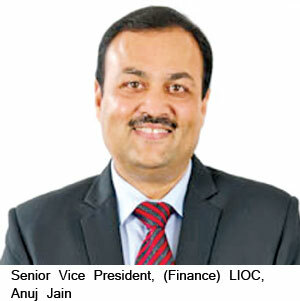 Senior Vice President, (Finance) LIOC, Anuj Jain said the company plans to make Trincomalee a hub for bunkering operations for the entire the region. Trinco port which is known as the world’s 5th best natural harbour provides an excellent opportunity to provide bunkering facilities for the vessels operating on the Bay of Bengal–Western Countries shipping route. He said they also have plans to develop the remaining tank farms in Trincomalee. “However the trade unions are blocking this move and this project is now on hold.” Lanka IOC already operates 15 oil storage tanks out of 99 tank farms in Trinco. He was speaking at a function to launch the 15th annual National Business Excellence Awards (NBEA) 2018 organized by National Chamber of Commerce of Sri Lanka. He also said the company is looking at more opportunities to diversify its business in Sri Lanka and looking at investing in solar and wind power generation business.“We believe that such diversification will be the key for our success in Sri Lanka,” Jain said. “We observed how Sri Lankan consumers changed their vehicles and purchased the latest models in the international market. This gave us the opportunity to introduce several new Petro Chemicals and new types of fuel to the local market which has become very popular in the island.” Commenting on the Sri Lankan energy sector he said, more investments are needed in that sector. The 15th annual National Business Excellence Awards (NBEA) 2018 organized by NCCSL will be held on December 5 at the Colombo Hilton. The print media sponsor of the event is Lake House.